His name is Zinedine Yazid or means "the beauty of faith." The fifth and youngest child in the family. 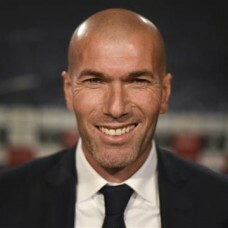 Zidane's parents Smail and Malika, sister Lila and brothers Nordine, Farid, and Jamel large, close-knit family and the right of the Islamic religion. Zidane's family emigrated to France in 1953 at the height of the Algerian war. Do not Yazid showed poor ability, like his older brother, but pay tuition family could not. The room boys from Zinedine were two posters with the players - Djamel Zidane and Enzo Franchsskoli. Djamel Zidane - the namesake and compatriot, midfielder of Algeria, legendary winning German team at the World Championships -82. Enzo Francescoli - Uruguayan football hero. Zinedine participates in parades and gatherings, which would be in full view of Marseille coaches. Small clubs Marseille "Saint-Henri", "Sept-le Vallon" were the beginning. Babies give shape, more or less trained and give plenty to play football on the field. 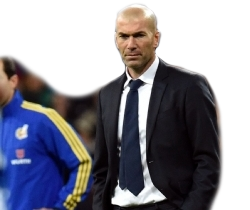 Jean Varro found Zidane at the next review of and recommended him to the club "Cannes". So he became a member of the club's youth team. A year later, already living in the dormitory center Mimoň, constantly playing in youth teams and is involved in various teams. He learns in school sports, and the club pays for room and board. With Fabrizio Monachino he plays Cadet part of the France team. And gradually it passes through all stages of the youth to the youth team of France. May 20, 1989 as a candidate Zidane in an away match against "Nantes" the first time out for the replacement. The game is the first French division was his debut. The main problems at the moment Zidane was weak Headers and behavior on the field, so it was very emotional. Often he beats rivals head into his chest as furious. "Cannes" in 1990/91 managed to take 4th place in the championship. However, the following season was a disaster. In 1992, Zinedine Zidane agrees and signs a contract with "Bordeaux". 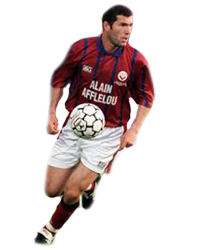 Playing in the "Bordeaux" Zizou in his first season scored 10 goals. In 1996, at the end of the European Championship Zidane was sold to the Turin "Juventus" for three million euros. As part he spent five years and was named the best player in the world. During this time he won two championships in Italy (1997, 1998), the Italian Super Cup (1997), European Super Cup (1996) and the Intercontinental Cup (1996). On August 17, 1994 as part of the French national team, I spent visiting a friendly match against the Czech Republic. As part he played 106 matches and scored 29 goals. He took part in three World Cups (1998, 2002 and 2006) and three European championships (1996, 2000 and 2004), first midfielder, then captain. The most productive tournaments are considered to be the 1998 World Cup and Euro 2000. Playing in the national team of France became the Champion of the World in 1998. Vice-world champion in 2006. European Champion in 2000. Winner of the Cup of the King Hassan II in 1998 and 2000. Zidane has learned to skillfully play head. World Cup 1998 made him a national hero, thanks to two successful attacks, it is with the head. Zidane received the title of best player in the world and the "Golden Ball" at the end of 1998. There was a great demand, began acting in commercials. Playing for the national team Algerian by birth, he seems to be personified the unity of the French team a multinational composition. The sensational defeat of the French national team at the European Championships and the political party "National Front," Le Pen said immediately - "in the team too many foreigners". At that Zinedine boldly replied that the multinational composition of the French team - the best anti-propaganda nationalist prejudices Le Pen. At the end of the 2000/01 season, July 9, 2001 Di Stefano, honorary president of "Real" gave Zinedine Zidane club t-shirt with number 5 th. The amount of the transfer was a record - 78 million dollars. The income of the player of the game in the "Real" ranged from 5.6 mln. To 7.2 mln. USD. Per year. Only for the first two years of the game in the "Real" Zizou won the Intercontinental Cup and the Spanish Super Cup, Champions League, the Spanish Cup and the European Super Cup. In 2006, Zinedine Zidane in the composition of the French team reached the World Championship final. During the final match, "Italy - France" between opponents Zidane and Marco Materazzi there was a verbal altercation that ended branded blow in the chest. Zizou received a red card and left the field. Without the captain of France's national team lost on penalties, he took second place. Zidane ended his football career at the end of the world championship in 2006. June 1, 2009 he worked as assistant to the president of "Real" Florentino Perez. On 12 November 2010 he became advisor to club president Florentino Perez. Since May 2011 - the sports director of Real Madrid and coach children's teams. With his wife Zidane met while living in the heart of "Memon". Veronica Fernandez won his first sight. She lived there and studied at the dance school. For the first time together in public they appeared at the presentation of his first red car "Renault Clio" for the winning goal. In May 1994, they were married. Happy parents of four sons. In France, Zidane is very loved and respected not only for football achievements. An exemplary family man, faithful husband and an excellent father. He always put family and its interests in the first place. Since his move to Madrid "Real" is often associated with the origin of his wife. Spaniard did not like the climate of Turin "Juventus", and she insisted on moving. Zinedine often refused public events in order to spend more time with his family. Brought up in the love of parents, their son became successor of family values. Always he said he wanted to have at least four children. Enzo - so named his first-born Zidane. Zinedine Zidane loves children and does a lot for the development of children's sports. At the end of his sports career in 2006, he is very much involved in charity work. Organizes and he takes part in the children's football matches for charity fees. To sponsor the construction of the children's department in one of the hospitals of Algeria. As part of the children's football tournament arranged by the French company "Danone", carries out matches for the children. As a representative of the charity fund of the company. Actively participates in the program of social rehabilitation of children without homes and parents. One of the teams, which started Zidane was called "Forest" Now it's gone. But instead of her childhood friends created "Nouvelles vag". Zidane is now honorary president of the amateur club of La Castellana. Not just a president emeritus, and actively participating in the life of the team. Since 2001, Zinedine Zidane is a goodwill ambassador for the UN Development Program. Member of the European Association for the fight against leukodystrophy, specifically to fund the association at auction for 39,800 euro was sold to the Jeep brand Ford Expedition, which belonged to him. In 2006, the competition program at the International Cannes Film Festival documentary "Zidane, a portrait of the 21st century" was presented (Zidane, un Portrait du 21eme Siecle). 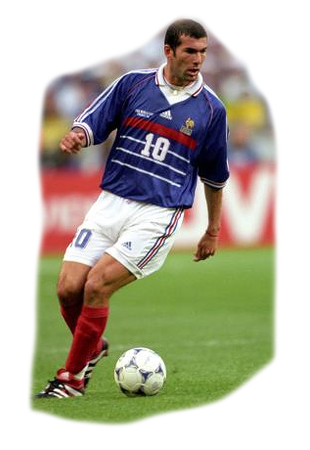 In 2008, he played a cameo role in the film "Asterix and Obelix at the Olympic Games" - Antique football Numa-rodiks on French manners "number 10", in the French team Zidane played in that number. The current adviser of the French Canal + Sapa1 for Sport. In 2007 Sapa1 + special exit program "Zidane Night" (from 9 pm to 6 am). Interview with the shy and reticent player in the world and the premiere of the documentary "The last match of Zidane" blew up the ratings. Zinedine Zidane is now most of the time tries to spend with the family, often in his native Marseilles. Actively engaged in teaching his sons "Signature trick." The first-born Enzo has shown great promise, speaking for the children "Real" under the guidance of coach Zinedine Zidane. player Career limited age range, but as he said himself Zizou "It's not like you're gone, it's important who you were." If you ask the Brazilians living in the homeland, in exile, or, say, playing in the championship of ..